Businesses have lost $634.1 billion simply because they couldn't supply the demand of customers. Stockouts are frustrating as you are losing potential sales simply because you don't have the product. It's not just about lost sales though. Your business and brand image are damaged when customers can't get what they are looking for. Frustrated customers then go to your competitors. Now you are left trying to win your customer back. This is not a smart way to do business. If your business has regularly stockouts then you need to follow this guide. There is a wise proverb that states, "For want of a nail the kingdom was lost". Take this to heart when it comes to managing your inventory and supply chain. Take the time to understand the process involved in making sure you have enough packaging materials, or packing materials, or any tiny component in your product. Nothing is more frustrating than having everything ready for shipment except for one tiny component. Automate your system and processes to help you monitor inventory levels. Then you will be automatically prompted to reorder when inventory levels reach a certain threshold. You can even program your system to know delivery times on reorders. This allows your system to never miss a reorder date. As inventory levels rise, it is difficult for an employee to keep up with that level of attention to detail and coordination. Automation is key when you consider that 70-90% of stockouts are caused by a failure to have effective shelf replenishment practices. One major component to automation is utilizing an RFID system. This is one of the best ways to optimize your inventory management. Every piece of inventory has a barcode. This labels your inventory for easy identification. It also specifically identifies your inventory. Instead of simply saying, you have 100 of the blue widgets, you can say this blue widget is number 67 of 100. Now you know exactly where each piece of inventory goes. Automation is great, but you need to know what your re-order threshold should be. Consider multiple factors when deciding what your threshold is. Think about the fluctuations in your supply of components. Look at the predictability of the demand of your customers. Factor in any increased demand as a result of the efforts of your marketing team. Look outside your business too. How reliable are your suppliers and what are the other factors that could affect your supply of inventory? About 10-30% of stockouts are from supply chain hold up upstream. Steamship lines and manufacturing glitches can cause delays. Once you have the answers to all of these factors you need to look at the different re-ordering strategies. Compare the strategies to your business' situation. This is not a one size fits all situation. The first thing you can do to be proactive is to deploy an effective inventory management system. You want one that does more than simply track your in-stock inventory. Your system should send you alerts based on the status of your inventory. These would include back-order adjustments, low stock warnings, back in stock notices, and shipment notices. Another part of being proactive is pre-ordering when you know customer demand will go up. This way you've already stocked up on the inventory. The downside is that you have extra inventory and you take the risk of it not selling. However, this shouldn't be a big risk if you are doing your data analysis and looking for trends. If you have your inventory listed in multiple places online, say your own website and Amazon, then creating a buffer will drastically reduce your stockout occurrences. You have two options when it comes to creating your buffers. The first is to limit the online locations of inventory when you have limited stock. Let's assume you sell shoes, and you only have two pairs of size 9 left in a particular style. You could take that shoe completely off of Amazon and only have them listed on your website. Another option is to completely remove the final two pairs of shoes from both Amazon and your website. Then have them on a discount or closeout site. You keep your main sales channel for products that current or new. While your leftovers and remnant inventory from last season are sold on a discount site. This helps you keep your current inventory management streamlined to current products and keeps your website fresh. Your other option is to show that you only have 50% of your inventory listed on all sites. That way, if you sell on both sites, you have the inventory to fulfill those orders. 50% of your inventory is allocated to your website, and 50% is allocated to Amazon. When you use an inventory management system you can program the software to account for an inventory buffer. This will help automate the process so that you don't need to constantly monitor your inventory levels and manually change inventory availability levels. If you know that your sales are stronger in one channel than another you could adjust the 50% ratio to be heavier towards your stronger market. So you would allocate 75% of your inventory to Amazon and only 25% to your website. If you aren't utilizing data analysis, you are missing out on a wealth of information. If you are monitoring the top 4 KPIs for your business then you should also have control over your order fulfillment process. These four are order accuracy, inventory accuracy, receiving speed, and shipping timeliness. When there are fewer mistakes and delays in your fulfillment process you can prevent stockouts by knowing exactly where your inventory is at any given time. Now that we've talked about the importance of data analysis, we need to talk about the importance of accurate data. All of the analysis in the world is useless if you are analyzing the wrong data. Make sure you have a system in place to accurately track your inventory, shipments, returns, lost product, and stolen products. When business gets busy, it can be tough to accurately track all of those different product movements. If you find that your numbers aren't matching up, then you have inaccurate data. This will lead to you thinking you have inventory when you don't or vice versa. 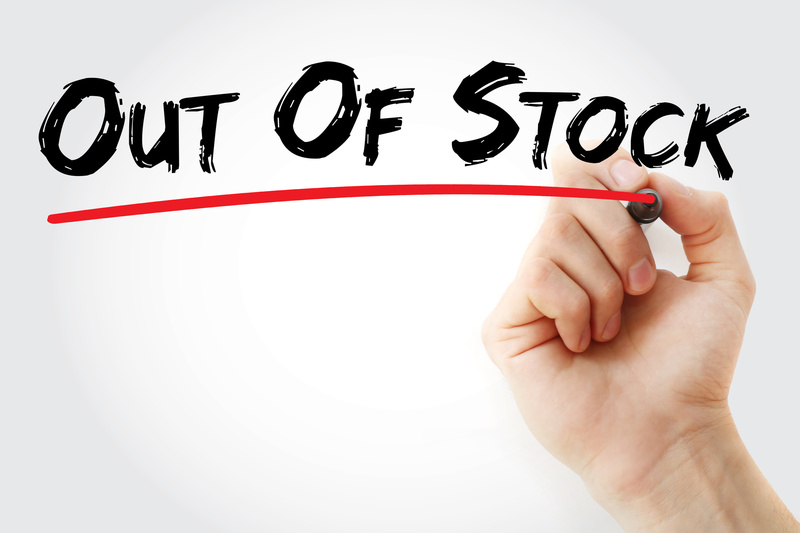 Inventory management systems can only do so much when it comes to preventing a stock out. You need to stay vigilant and organized to ensure that the correct inventory gets delivered to the correct locations. By staying organized, you know what inventory was ordered, so you can check your vendor's deliveries to make sure you received what you ordered. We aren't talking about fads or what's cool right now. What we are referring to is looking at your past occurrences of out of stock situations. Perform regular audits of your sales performance. For most companies, stockout occurrences tend to happen in patterns. This could be during a certain time of the week, month, quarter, or even year. As you perform your audit you can look for patterns. Once you identify one, you can predict when the next one will happen. Instead of letting it happen, you can be proactive and re-order or order more. Once you automate most of your system it becomes even more important to have a strong internal team. Hire people who have experience in managing inventory. You also want to hire people who understand your industry. They should know when the booms and lulls are in the demand. Look for an inventory management system that can provide real-time data. Timing is key when it comes to preventing a stockout. If your system only gives you monthly or weekly updates, by the time you are notified it may be too late. Real-time updates tell you the moment you drop below your threshold. This lets you act immediately to ensure your replacement inventory comes as soon as possible. When a customer encounters a stockout, 21-43% of them will leave the store or website. Then they go looking else ware to buy the product they want. That results in a 4% loss for the retailer. If you are shipping to a retailer and you stock them out, as their vendor, you are part of the problem. For a billion dollar retailer, that's $40 million a year in lost sales. By preventing a stockout, you can maintain a positive image and relationship with both your retailers and your customers. Let's have a chat about your fulfillment needs so we can prevent a stockout from happening to you.